1 Melt Spread in 12-inch skillet over medium-high heat and brown chicken, turning occasionally, about 5 minutes. 2 Stir in water, Recipe Mix and dill. Bring to a boil over high heat. Reduce heat to low and simmer covered, stirring sauce occasionally, 10 minutes or until chicken is thoroughly cooked. Remove chicken to serving platter and keep warm. 3 Remove skillet from heat; stir in sour cream. 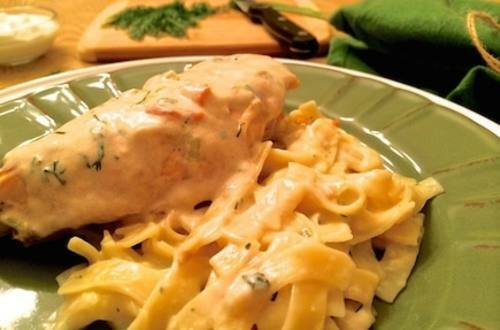 Spoon sauce over chicken and serve with Lipton ® Pasta Sides ™ - Creamy Chicken.